The original Audi TT is that rare thing: a concept car that made it into production. The Roadster version only served to broaden the TT's appeal and has sold strongly ever since it arrived in 1999. The interior shares the same clean, artistic styling as the TT Coupe and build quality is typically Audi – excellent – even if some rivals offer more space. The rear seats you'd find in the coupe have been sacrificed for space to stow the Roadster's easy-to-use, electrically operated hood, but it's no great loss – they were useless for adults anyway. 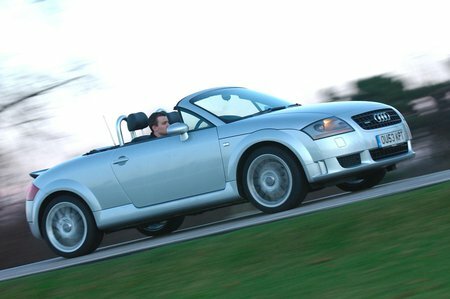 Roof up or down, the TT Roadster looks great. A front-wheel-drive 150bhp model arrived at the same time as the 3.2 V6 Quattro in mid-2003. The four-wheel-drive V6 also introduced the direct-shift automatic gearbox (DSG) for the first time, which did away with the clutch pedal but allowed lightning-quick manual changes from the gearlever or steering wheel paddles.